You’ve probably never heard of the “Incident at Olompali,” as no one has called it since, and your awareness of the Charlatans is likely limited to seeing the band’s name on scores of vintage rock posters, alongside more familiar monikers such as Jefferson Airplane, Quicksilver Messenger Service, Big Brother and the Holding Company, and Grateful Dead. That’s too bad, because in their heyday, from 1965 to 1968, the Charlatans were a lot of people’s favorite band, thanks to a danceable mix of distinctively American musical genres—from the blues and rock to Western swing and jazz. Around the time of the Charlatans’ first paying gig, in June of 1965, the Grateful Dead were still playing pizza parlors as the Warlocks, Jefferson Airplane had yet to take off, Big Brother was a year away from handing Janis Joplin a microphone, and Quicksilver was not even a gleam in anyone’s eye. By 1966, the Charlatans had a record deal with the same label that had released the 1965 smash hit Do You Believe In Magic? by the Lovin’ Spoonful. 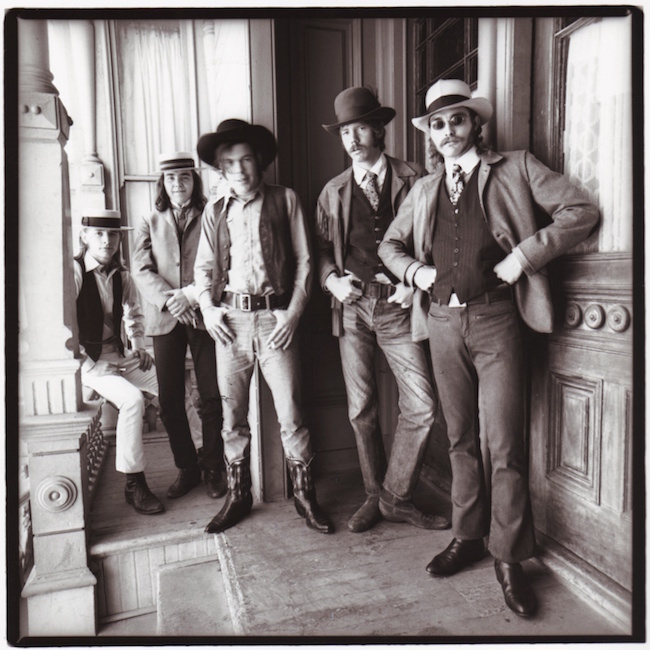 The Victorian-outlaw look of the Charlatans was captured best by photographer Herb Greene, whose photographs of the band were used in three posters by Rick Griffin and Robert Fried for shows at the Avalon Ballroom in May, June, and July of 1967. The band members in the top photo, from left to right, are George Hunter, Richard Olsen, Mike Wilhelm, Dan Hicks, and Mick Ferguson. Given their head start as performers, the Charlatans should have been one of the biggest music acts of the 1960s. They were doing acid tests before anyone even called them that, and were the first band to promote itself with a poster and perform while bathed in the glow of a light show. Just as importantly, the Charlatans were trailblazers at a moment in musical history when rock bands were being rewarded for conforming to the new psychedelic orthodoxy. In particular, the band’s embrace of Americana was years ahead of the Byrds, Grateful Dead, and Eagles, who also wove threads pillaged from those genres into their repertoires. That’s not to give the Charlatans credit for “Sweetheart of the Rodeo” and “Workingman’s Dead”—or blame for “Desperado”—but they got to the Americana party first. All of this should have worked in their favor, but by the Summer of Love in 1967, the band was self-destructing, and by the time Jimi Hendrix was playing the last notes of “Hey Joe” at Woodstock in the summer of 1969, the Charlatans were history. What happened? As a young architect in Los Angeles, Charlatans co-founder George Hunter made presentation models for the Los Angeles County Museum of Art, which opened in 1965. Photo by George Garrigues via Wikimedia Commons. When Lewis transferred to San Francisco State College in 1962, Hunter followed her there, too. And that’s how he met his future co-founder of the Charlatans, Richard Olsen, who’d left Chicago a year or so earlier to study jazz and maybe, just maybe, make it as a musician in the vibrant jazz scene in San Francisco’s North Beach neighborhood. 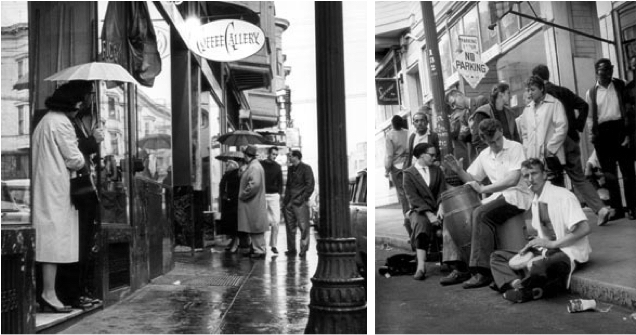 Charlatans co-founder Richard Olsen was lured to San Francisco in 1961 by the beatnik jazz scene in North Beach, seen here in 1959 (left) and 1961 (right). Photos by Jerry Stoll. “I actually met Lucy before I met George,” Olsen says. “She was a dancer, and I was a music major, studying clarinet—we were both in the creative arts department at San Francisco State.” Before long, Hunter and Olsen were collaborating with Lewis on the dance performances she was choreographing with her roommate, Joan Alexander. Lewis recruited Olsen to be one of her dancers. Hunter, whose interest in hi-fi audio components was as keen as his affinity for architecture, provided the sounds. The San Francisco Tape Music Center at 321 Divisadero was an early creative outlet for George Hunter. He provided sounds for his girlfriend Lucy Lewis’ dance-and-theater company—it was called 123 in an inverted homage to the center’s address—which performed there, and Hunter even made the center’s sign out front. 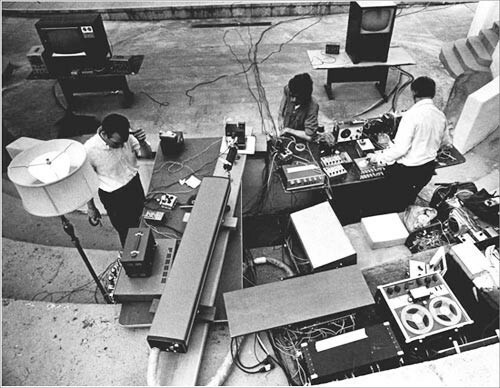 For a while, Hunter and Olsen were active members of Lewis’ avant-garde theater-and-dance company, which she called 123—the name was a play on the addresses of the San Francisco Tape Music Center at 321 Divisadero Street, where 123 sometimes performed. In retrospect, though, Hunter and Olsen’s enthusiasm for 123 may have been because the two young men were at loose ends. 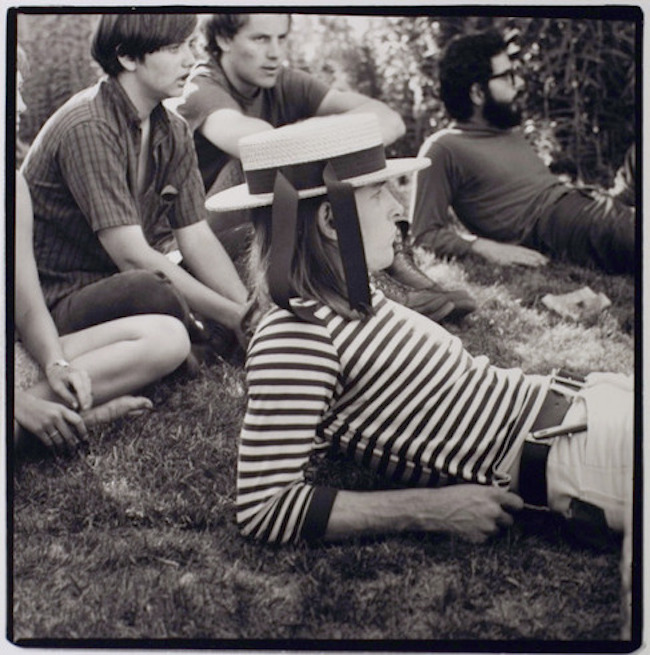 At some point in 1963, Olsen was kicked out of SF State because his hair was too long, even though his locks were partially obscured by a hat. “I wore one of those newsboy caps, like Bob Dylan did,” Olsen remembers. As for Hunter, he was experimenting with a new business opportunity in the counterculture economy. “I used to go down to Los Angeles, score a couple of kilos of grass, and bring it back. You could get twice as much for it in San Francisco,” he says matter-of-factly. Hunter still had a lot of friends and contacts in L.A., among them Mike Wilhelm, who had been a classmate of Hunter’s at Canoga Park High School. Wilhelm would become the Charlatans’ lead guitarist, but during the period when Hunter and Olsen were performing with 123 up in San Francisco, Wilhelm was doing a two-year stint in the Naval Air Reserves, which took him from his base at Los Alamitos, just south east of downtown Los Angeles, all the way to the coast of Vietnam. Between assignments, he gave himself the musical education that would become such an important part of the Charlatans’ sound. 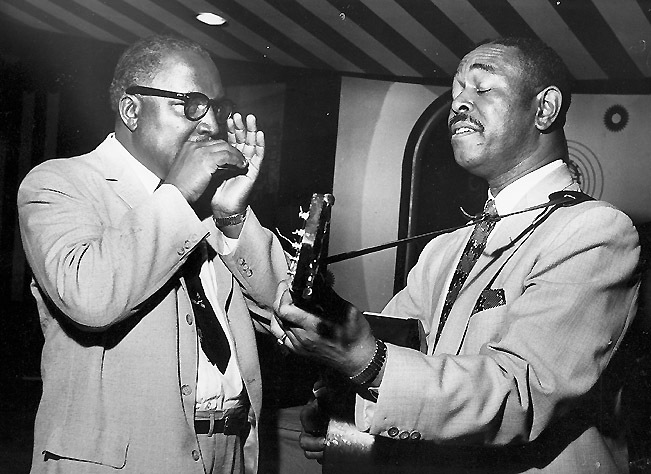 The biggest early influence of Charlatans guitarist Mike Wilhelm was Brownie McGhee (right), seen here at the Marquee Club in London with his longtime performing partner, harmonica player Sonny Terry. Via Chris Barber LP Collection. Wilhelm also did open mics at the Blue Unicorn on Hayes Street in San Francisco, which is how he reconnected with George Hunter, bumping into his old friend on the street. 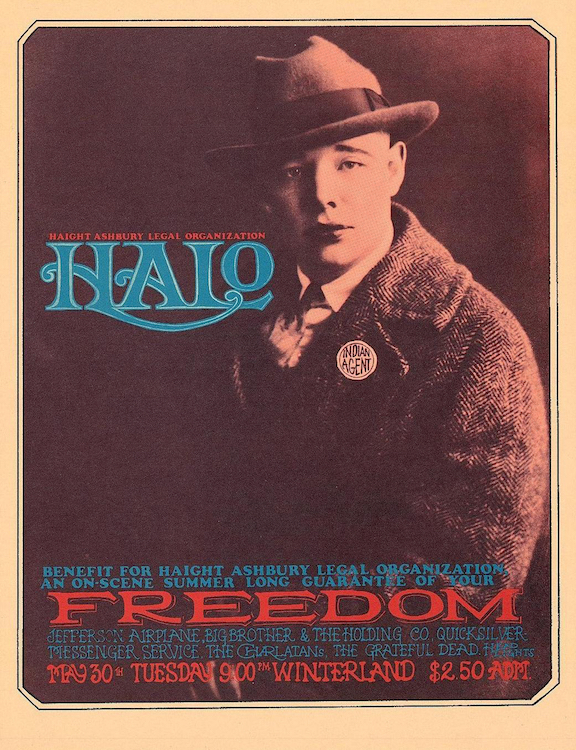 By the summer of 1964, Wilhelm was living in Hunter and Lewis’ flat at 200 Downey Street, just up the hill from the Haight-Ashbury neighborhood. The pieces of the Charlatans were coming together, but the catalyst for the formation of the Charlatans had actually occurred a few months earlier, on February 9, 1964, to be exact, when The Beatles first appeared on “The Ed Sullivan Show.” The live telecast was watched by an estimated 73 million American viewers, about a third of the entire U.S. population at the time. 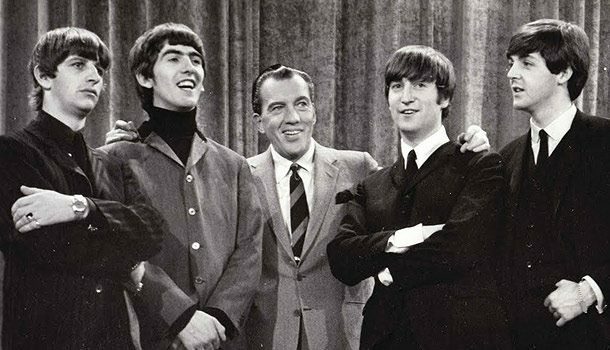 No doubt countless U.S. musicians were inspired to start their own bands after seeing The Beatles perform on “The Ed Sullivan Show” on February 9, 1964. George Hunter was watching that night, too. “It was, like, ‘Well, gosh, we could do that!’” Hunter says. “I didn’t want to be a clarinet or sax player in a Beatles- or Rolling Stones-type band,” Olsen continues. “I wanted to play an instrument that would allow me to sing, so I ended up learning bass, but we still needed a guitar player. Then, one day, George says, ‘I know this guy. 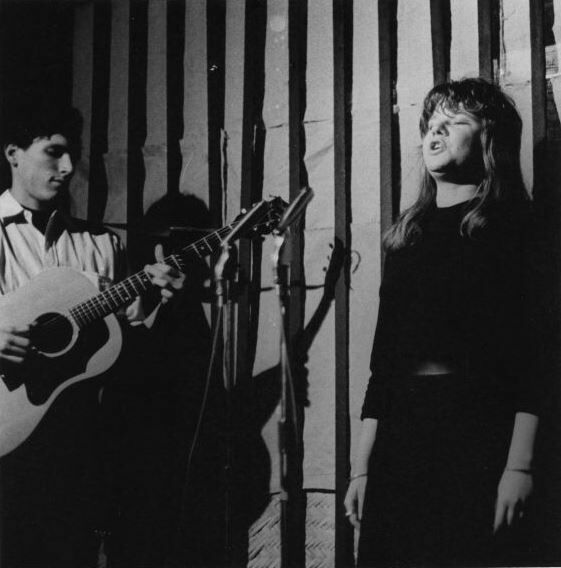 He plays at the Blue Unicorn.’” Enter Mike Wilhelm, followed by Mike Ferguson (1942-1979), who was an antiques and vintage-clothing dealer, a graphic artist, and a pianist. Drummer Sam Linde, who lived upstairs from Hunter and Lewis, was the last to join the band’s initial lineup and the first to be replaced—within a few months, Dan Hicks (1941-2016) was sitting behind the drum set. George Hunter in San Francisco, circa 1966. Photograph by Herb Greene. As it turned out, Hunter’s limitations as a musician allowed the talents of the other band members—Ferguson’s barrelhouse piano, Olsen’s fundamentals in jazz, Hicks’ fondness for folk and swing, and Wilhelm’s blues bona-fides—to shine, giving the Charlatans its distinctive sound. By Olsen’s count, four names were tossed around at various points. Fifth Column never stood a chance (too intellectual), but the Androids briefly stuck. In part, the name was an homage to one of Hunter and Wilhelm’s literary heroes, Ray Bradbury, who used to give readings at Coffee House Positano in Malibu, which the two high-school friends used to frequent. “George had this idea that we’d play electronic music, and we’d be in these androidy costumes, sort of like Devo, but about 20 years earlier,” Wilhelm says. 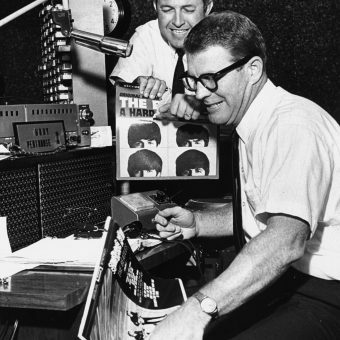 Richard Olsen (left) and Mike Wilhelm in San Francisco, circa 1966. Photograph by Herb Greene. Everybody, that is, except maybe Lucy Lewis, whose vision of building a successful dance-and-theater company could not compete with her boyfriend’s dream of being an American version of The Beatles. 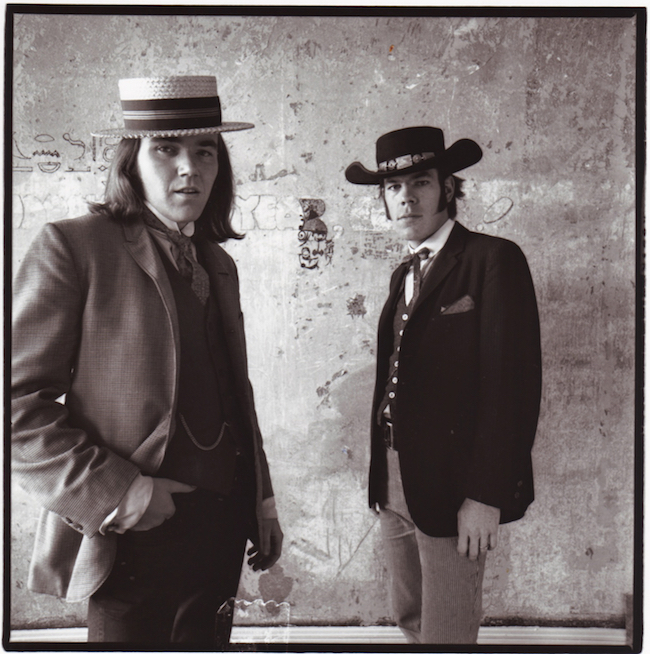 Dan Hicks (left) and Mike Ferguson in San Francisco, circa 1966. Photograph by Herb Greene. For those who were not there, it may help to explain that in the 1960s, there were “drugs” and there were “hard drugs.” Marijuana and LSD, the latter of which was legal in California until October of 1966, were drugs—lots of people took drugs. Meth and heroin were hard drugs—speed freaks and junkies took hard drugs. In others words, the Charlatans already had one junkie in the band—that was enough. Olsen also isn’t so sure Janis Joplin would have ever become a member of the Charlatans, although he doesn’t exactly dispute the drug part of Hunter’s story. “She used to come over when we were rehearsing,” he says, “as did Grace Slick. I knew Janis was a singer, but she never sang anything when she was here. But she used to come over, for, whatever,” he says, trailing off. Drugs aside, the work of turning Hunter, Olsen, Wilhelm, Ferguson, and Hicks into the Charlatans got done. For example, immediately after that “Eureka!” moment when the Mainliners were suddenly the Charlatans, Hunter sat down and designed what would become the band’s logo. “Right then and there,” Olsen remembers, “George started drawing the lettering for the name.” Wilhelm remembers the same thing, and that lettering would be used on everything from the first poster for the band’s first show in 1965 to its debut album, which was released in 1969, too late to help the band’s fortunes. 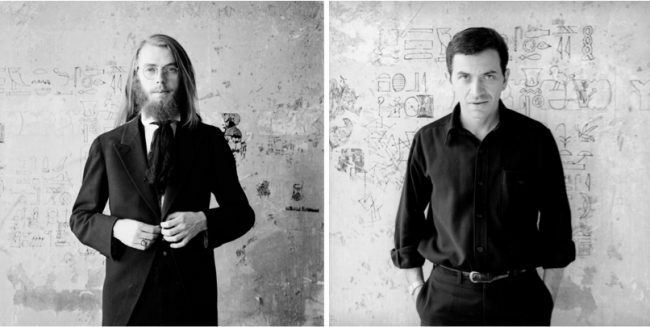 By then, Wilhelm and Olsen were the band’s only original members, and within a few months, what was left of the Charlatans would dissolve for good. 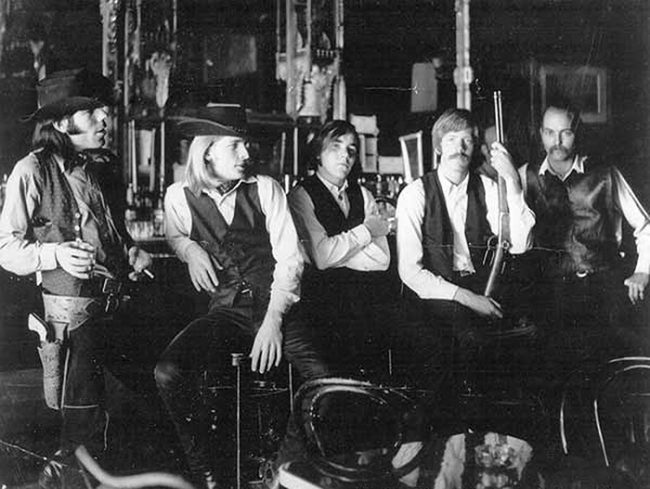 When Mark Unobsky bankrolled the Red Dog Saloon in the summer of 1965, he hired the Charlatans to be the house band. Whoever they were, whatever they were, by the spring of 1965, the Charlatans were ready to leave the confines of Hunter and Lewis’ front room and take their show on the road. And as had been the case when Wilhelm happened to run into Hunter a year or so earlier, serendipity gave the Charlatans their first gig. The guy in the car turned out to be Chandler Laughlin, who’d been one of the owners of the Cabale, the folk club where Wilhelm had first played when he got to Berkeley. Laughlin was now involved in the remodel of a three-story, 1863 building in the old silver-mining town of Virginia City, Nevada, about a six-hour drive due east of San Francisco. 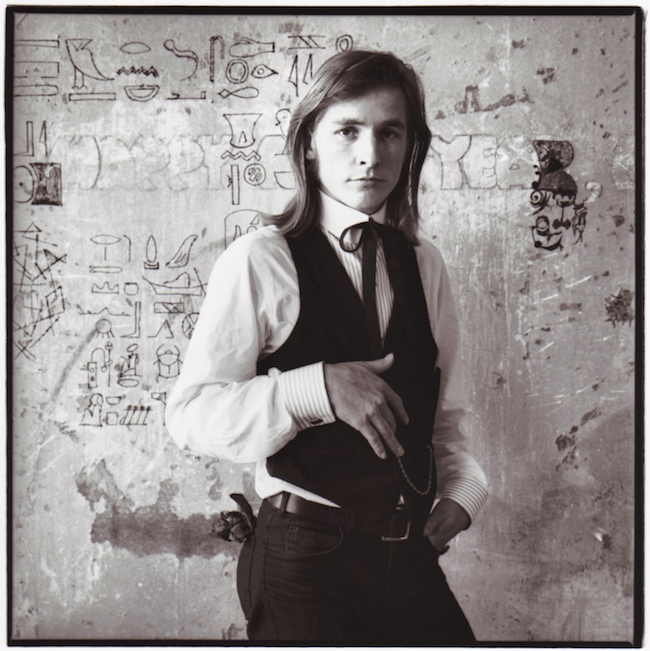 Bankrolled by counterculture folk hero Mark Unobsky, the Red Dog Saloon, as the building’s ground-floor bar was renamed, would become an unlikely crucible for rock ’n’ roll and LSD in the high desert of Nevada. 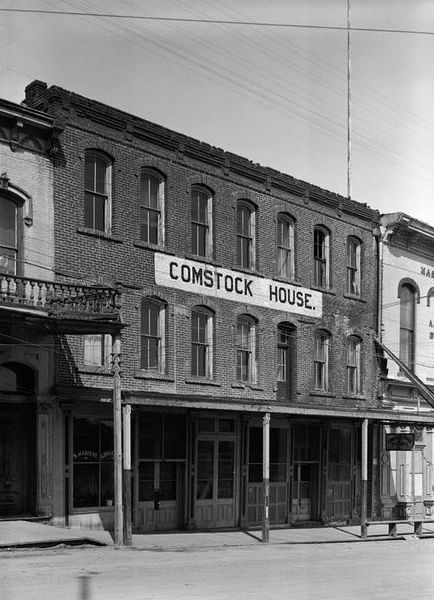 In 1965, the Red Dog Saloon occupied the first floor of the Comstock House, which was built in 1863. Today, the Red Dog continues to draw music lovers to Virginia City, Nevada. 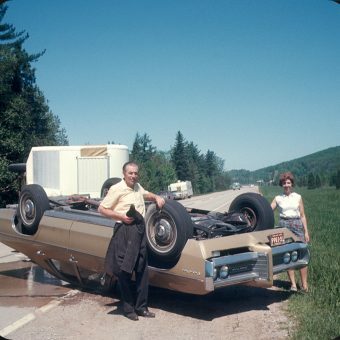 Archival photo via the Red Dog. “Yeah, I’m pretty sure that happened,” Hunter confirms. It was at the Red Dog that the look of the Charlatans came together. This photo of the band from 1965, taken at the Red Dog, is by William Westwick. 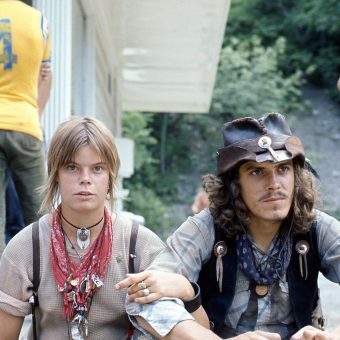 Part of the vibe was captured via their attire, which now expanded beyond dandy duds to include clothes that might have been worn by late 19th-century outlaws. “When we got to the Red Dog, our persona really started coming together because of the Western influence of Virginia City,” Olsen says. 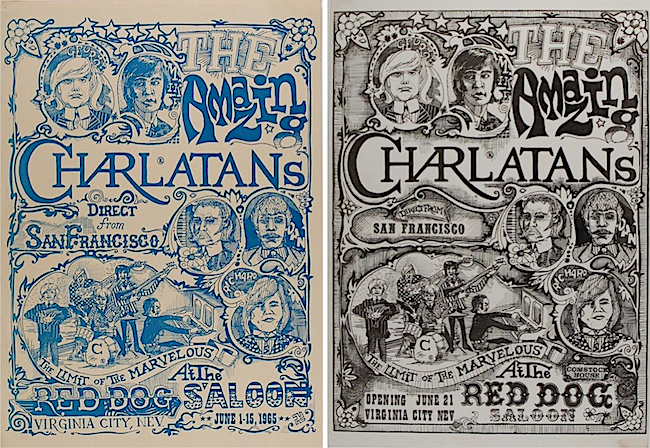 The two versions of the poster created by Mike Ferguson and George Hunter for the Charlatans’ 1965 shows at the Red Dog are both known as “The Seed” because the poster started the psychedelic-poster revolution that would flower the following year. Guns were a part of this evolving look. “Mark wanted everybody to have a weapon,” Wilhelm says. 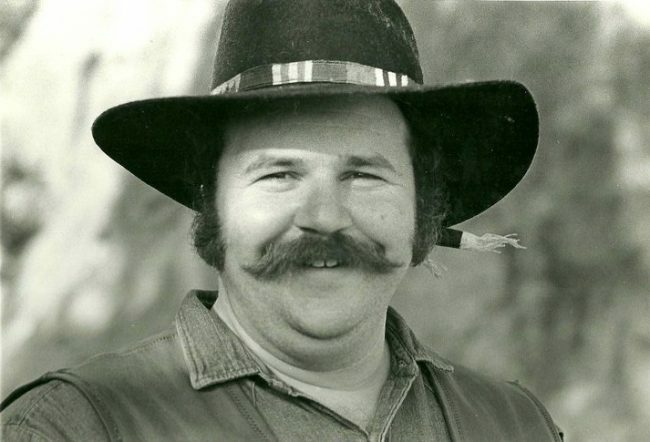 “He sent us all up to Charlie Stone’s bar and arms museum to pick out a gun, and then he paid for them.” George Hunter’s .30-30 Winchester Carbine, the rifle that would scare the daylights out of Jerry Garcia at Rancho Olompali about a year later, was picked up during this Wild West shopping spree. Inside the Red Dog, the Virginia City vibe would morph to include two more visual elements, each of which would be deemed essential to the coming dance concerts in 1966 at the Fillmore and Avalon. 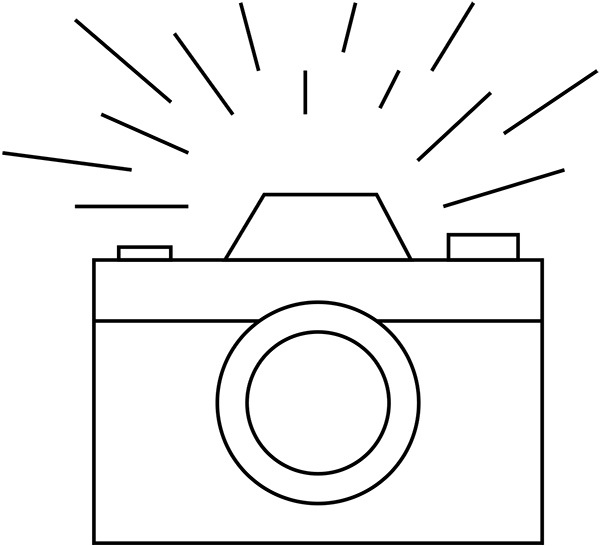 The first of these was the light show, which was an evolution of the lighting effects used by experimental theater companies like 123 throughout the early 1960s. Bill Ham was tapped to provide the light show for the Red Dog’s opening, but because he could not commit to moving to Virginia City to run the light show every night, he and a friend named Bob Cohen built a machine that would produce light effects automatically. Mike Ferguson used elements from a 1914 poster for the Great Kar-Mi Troupe in The Seed poster for the Charlatans. 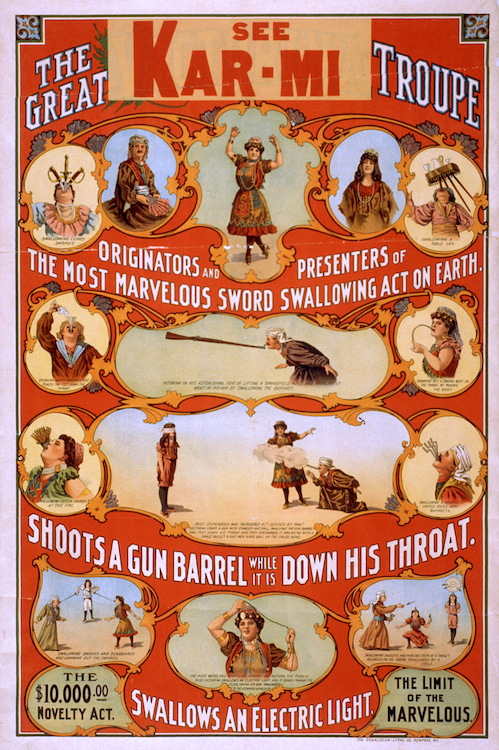 The phrase at bottom-right, “The Limit of the Marvelous,” would also make its way onto subsequent posters for the band. 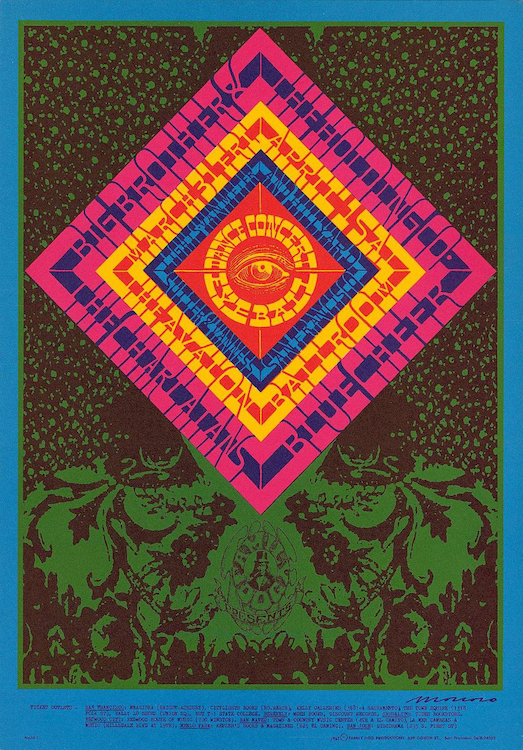 The Seed is often referred to as the first psychedelic poster, but compared to what would come later, there was nothing especially psychedelic about it. In fact, Ferguson took the general layout for The Seed from a 1914 poster for the “Great Kar-Mi Troupe,” which promised acts performing at “The Limit of the Marvelous,” a phrase that would find its way into many subsequent advertisements for the Charlatans. With their wardrobe in hand, light show operational, and poster announcing the debut of “The Amazing Charlatans,” finally it was time to play. “About a week after we’d arrived, Mark Unobsky comes by to tell us that the audition would be that night, and we’d be playing for the whole staff,” Olsen recalls. 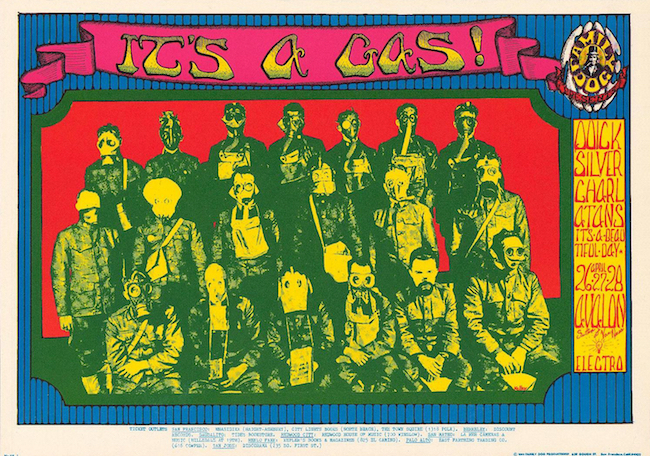 “Mark had been going to each person’s room, saying, ‘Here’s a little sugar cube.’ So everybody in the whole place, not just us in the band, but everyone, was loaded on LSD.” To put this in its counterculture-history context, the first acid test conducted by author Ken Kesey and members of the Merry Pranksters, with music by the Grateful Dead, would not take place until December of 1965, a full five months later. “It felt like it lasted the whole summer,” Olsen says. 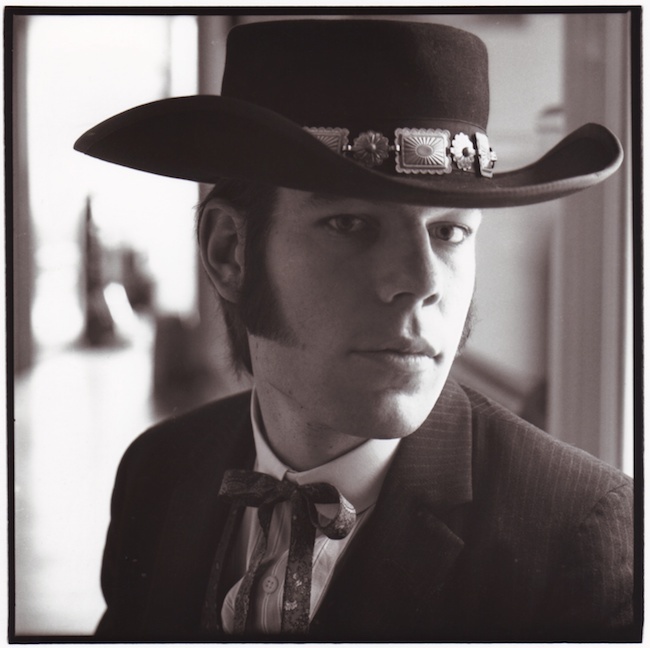 In part, that may have been because a sizable portion of those six weeks was spent tripping on LSD, which was reportedly supplied to Unobsky by Owsley Stanley, yet another Angeleno who would have a profound impact on the San Francisco music scene (Owsley is best known for bankrolling the Grateful Dead with the money he was making manufacturing and selling LSD, both before and after the drug was made illegal). The Charlatans and some of their “old ladies,” photographed at the Palace of Fine Arts in San Francisco by Herb Greene. 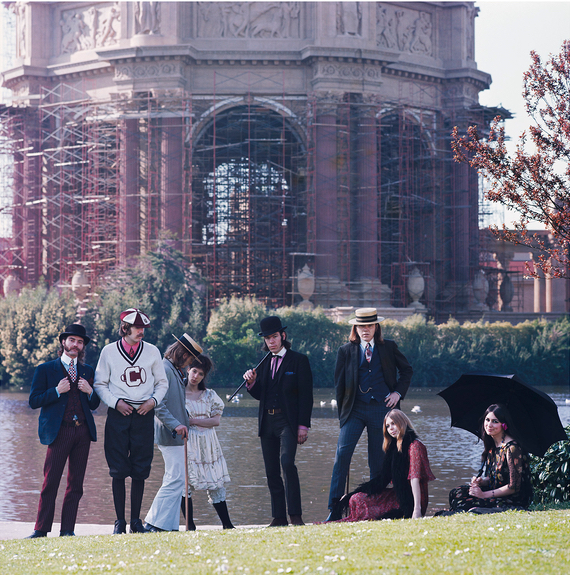 From left to right: Mike Ferguson, Dan Hicks, George Hunter, Lucy Lewis, Mike Wilhelm, Richard Olsen, Susan Pilborough, and Carmella “Candy” Storniola. Mike Wilhelm, photographed by Herb Greene. For Wilhelm, a more productive use of his Mondays was to drive to San Francisco to lay in supplies for the rest of the week. And as the summer was winding down, he made what would be his last such trip. For this show at the Avalon in September of 1967, the Charlatans shared the bill with the great blues guitarist Buddy Guy. Poster by Robert Fried via ClassicPosters.com. The Furthur bus, circa 1965. Via NoFurthur.com. 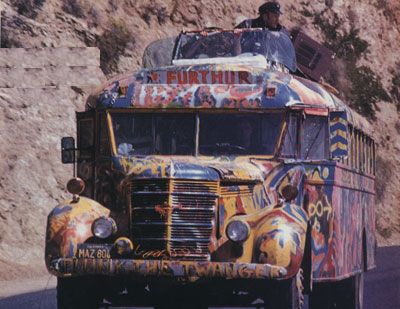 As in the “Furthur” bus, which, in 1964, had been famously driven across the United States, with Ken Kesey and the Merry Pranksters on board. Neal Cassady—the model for the Dean Moriarty character in author Jack Kerouac’s “On the Road,” as well as “Cowboy Neal” in a Grateful Dead song—was behind the wheel. Which is to say, the Charlatans were not overly impressed by the arrival of Kesey and company—they were more concerned with the fact that their lead guitarist had just been arrested. The night after their last show at the Red Dog, the Charlatans played their first gig in San Francisco, opening for Larry Hankin of a comedy group called The Committee. The “Don Sturdy” who’s listed at the top of the poster is better known by his real name, Howard Hesseman—he hired Mike Wilhelm for his first paying gig in San Francisco at the Coffee Gallery in 1963. And so, the Charlatans’ historic six-week run at the Red Dog Saloon in Virginia City, Nevada, came to an abrupt end. Wilhelm would avoid jail time, but now he had a record, which would come back to haunt the band a couple of years later. In the meantime, the Charlatans were rehearsed and tight, ready to ride the momentum. Which is why the night after their last performance at the Red Dog, the Charlatans were playing in San Francisco, opening for a one-man show starring a friend of the band’s, Larry Hankin of The Committee. More gigs would follow that fall at the Matrix, a new club on Fillmore Street opened by Marty Balin of Jefferson Airplane, and at Longshoremen’s Hall, which was rented for three concerts in October by Luria Castell, Ellen Harmon, Alton Kelley, and Jack Towle, who called themselves the Family Dog. Castell and company had been at the Red Dog, too, dining on Unobsky’s food and dropping his acid while helping Chandler Laughlin run things. As fate would have it, they now all found themselves renting rooms in a boarding house on Pine Street, one of several managed by Bill Ham, who had provided the light-show machine for the Charlatans’ run at the Red Dog. 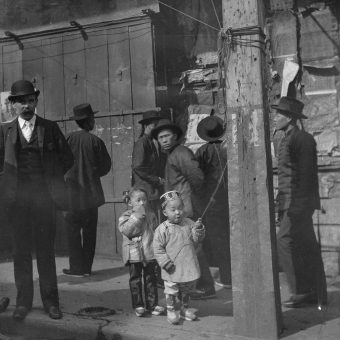 Hunter and Lewis had moved there too, making Pine Street the center of San Francisco’s burgeoning hippie scene. The three shows at Longshoremen’s Hall in October of 1965 are considered watersheds in San Francisco rock history, not least because they preceded the more famous Trips Festival in late January of 1966, which was also held at the hall, by three full months. 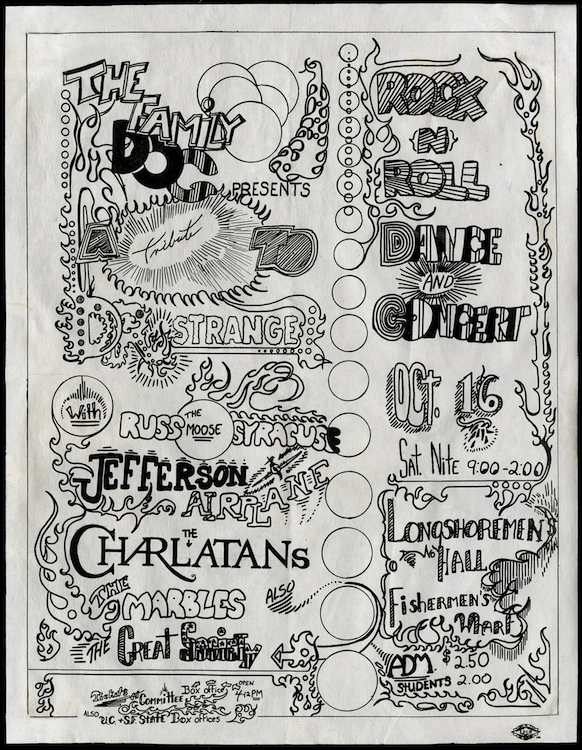 Each of the Family Dog’s October concerts featured the Charlatans, but people also attended those shows to see Jefferson Airplane, the Lovin’ Spoonful, and the Mothers. In October of 1965, the Family Dog produced three shows at Longshoremen’s Hall. Each was promoted as a “tribute” to various comic-book characters, and each featured the Charlatans on the bill. Via ClassicPosters.com. By the beginning of 1966, the speed was breakneck. “Instead of just five bands who wanted to play, now there were 20 or 30, coming from cities like Seattle, from Texas, and from other places,” Olsen says. Potentially, any of the bands on the scene stood in the way of Hunter’s dream of turning the Charlatans into the American Beatles. So, in partnership with the Family Dog and Rock Scully—who would soon become one of the Grateful Dead’s managers—Hunter produced a pair of Charlatans shows at California Hall. The Charlatans headlined the first date on January 8, with Jefferson Airplane as the opening act. On that night, the place had been packed, thanks, as Hunter would learn at the second California Hall show, to the Airplane’s exploding fan base. Along with the Family Dog and future Grateful Dead manager Rock Scully, George Hunter produced a pair of shows in early 1966 at California Hall. The first one with Jefferson Airplane was a huge success, but the second with Electric train was a bust. Hunter designed the first and collaborated with bandmate Ferguson on the second. Both via ClassicPosters.com. 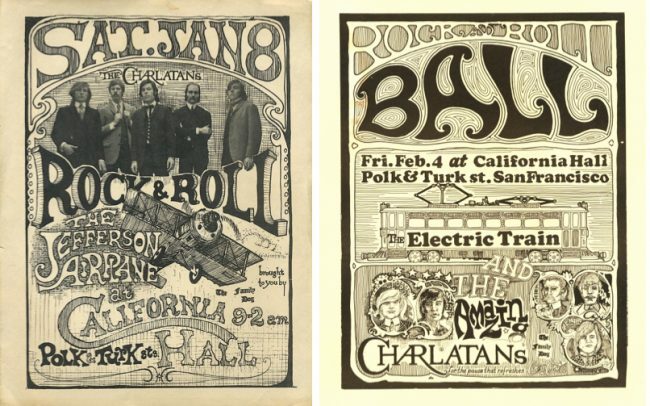 In fact, on the same night, February 4, that the Charlatans opened for Electric Train at California Hall, Jefferson Airplane was headlining Bill Graham’s first non-benefit concert at the Fillmore Auditorium. The Airplane would also take top billing a few weeks later when the newly re-organized Family Dog, now being run by Hunter’s old friend Chet Helms, produced its first concert, also at the Fillmore. Despite having been first out of the starting gates, the Charlatans were already playing catch up. Which finally brings us back to Rancho Olompali. In May and June of 1966, or thereabouts, the old estate was being rented by the Grateful Dead, which was quickly becoming the band. There, the competition for gigs at Bill Graham’s Fillmore and the Family Dog’s new home, the Avalon Ballroom, could momentarily give way to the thing that had lured everyone to the scene in the first place—music. George Hunter (in hat) at Rancho Olompali, late spring, 1966. Photograph by Herb Greene. It was on the same day that George Hunter did not aim his rifle at Jerry Garcia. “The Dead had just moved into Rancho Olompali,” Olsen recalls. Members of the Charlatans, along with numerous other singers, guitarists, drummers, and keyboard players in San Francisco’s new rock royalty, had been invited to a party at the band’s new digs. Yes, the same rifle Hunter had picked up in Virginia City, where he often went shooting under the considerable influence of psychedelics. Today, the idea of bringing a loaded weapon to a party while high on drugs would probably strike most people as a recipe for disaster, but at the time, for Hunter, it didn’t seem radically out of the ordinary. A party at Rancho Olompali, late spring, 1966. Photograph by Herb Greene. 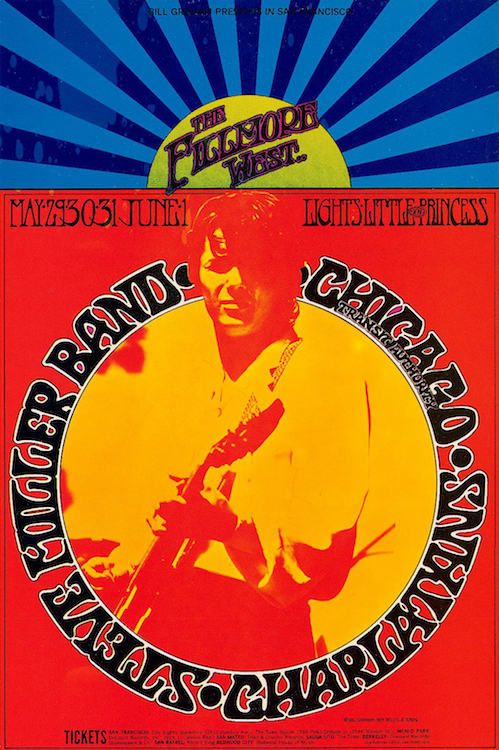 Around the same time as the party at Rancho Olompali, shown in the images above, the Charlatans were playing the Fillmore, as seen in this poster by Wes Wilson. Via ClassicPosters.com. Using a Herb Greene photo, Hunter designed this ad to announce the Charlatans’ first single on Kama Sutra, but the label had second thoughts, and it was never released. At the time of the Incident at Olompali, the Charlatans had one thing going for them that most other San Francisco bands didn’t—a recording contract with Kama Sutra Records. Had the Charlatans been able to release an album in, say, the fall of 1966, that would have put them in the same club as Jefferson Airplane, whose debut album for RCA dropped in August of 1966, and the Grateful Dead, whose eponymous first LP for Warner Bros. hit record stores in March of 1967. It was not to be. To this day, none of the surviving Charlatans know for sure exactly why Kama Sutra balked at releasing their album. The problems began with the choice for its first single, produced by Lovin’ Spoonful producer Erik Jacobsen—a cover of a 1963 Buffy Sainte-Marie song called “Cod’ine,” with the Charlatans’ version of bluesman Robert Johnson’s “32-20” as the B-side. The Charlatans shared the bill with Quicksilver Messenger Service on numerous occasions. This poster from April 1968 is by Alton Kelley. Via ClassicPosters.com. This early Wes Wilson poster from 1966 for a Family Dog show at the Fillmore includes Hunter’s Charlatans logo. Via ClassicPosters.com. Over the years, Hunter and Olsen have wondered if it may have been more than the song’s content that killed their first 45. “The Lovin’ Spoonful had an autoharp; we had an autoharp,” Olsen says. “They played sort of old-timey stuff; that’s what we did.” Could it have been that Kama Sutra was secretly concerned about the impact the Charlatans’ success might have had on its golden goose, the Lovin’ Spoonful? “In their dreams,” Jacobsen says, laughing. “Listen, I’ve been friends with those guys for years, and I’m really glad we gave it a shot, but as far as I know, that is absolutely not the case.” The problem with the Charlatans, Jacobsen says, was simple—the drug reference aside, they did not have a hit-maker like John Sebastian in their band. By the summer of 1966, Sebastian had written “Do You Believe In Magic,” “Daydream,” “Did You Ever Have To Make Up Your Mind,” and “Summer in the City,” which reached No. 1 on the “Billboard” pop charts. 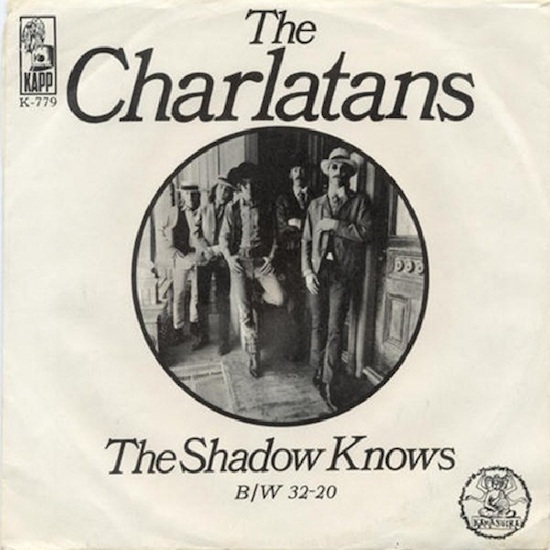 After their “Cod’ine” single was killed by Kama Sutra Records, the Charlatans released a novelty tune called “The Shadow Knows” with Kapp. Not surprisingly, the 45 went nowhere. 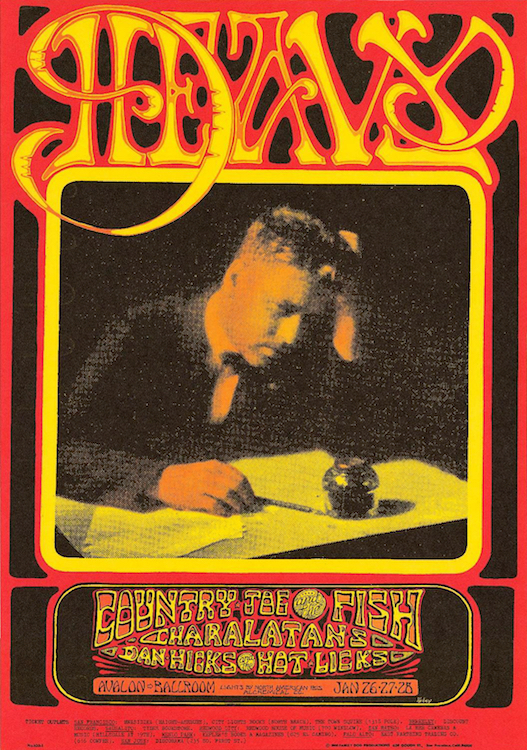 Instead of releasing “Cod’ine,” Kama Sutra handed the Charlatans and its Jacobsen-produced recordings over to Kapp Records—Jacobsen stayed on as the band’s producer. “Erik came back and told us he had this great idea for a tune that we should do,” Hunter says, “and that we could put it out as a single. It was a novelty tune from the ’50s by the Coasters called ‘The Shadow Knows.’ I don’t know how we could have been so docile to just stand there and let him talk us into that, but we did. It didn’t stand a snowball’s chance in hell going anywhere.” And, it didn’t. 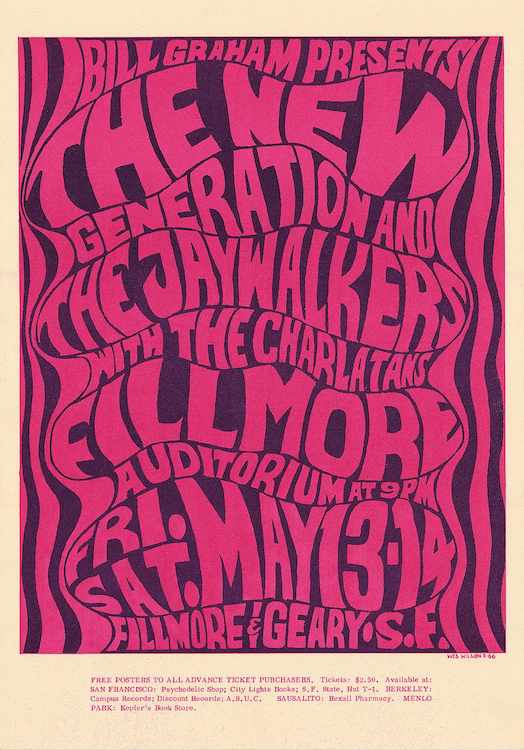 Although there were lots of places to see music in San Francisco in the late 1960s, the Fillmore and the Avalon were the two main dance halls. 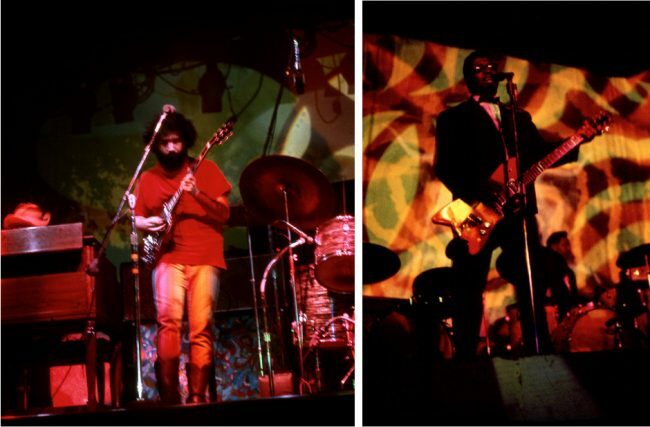 At left, Jerry Garcia performing at the Fillmore with the Grateful Dead in 1968. At right, Bo Diddley performing at the Avalon in 1967. Both photos by Steve Fitch. 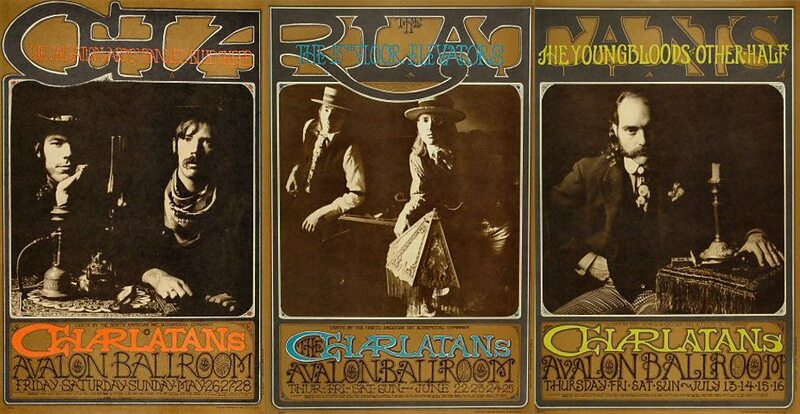 By 1967, with the prospect of a hit record looking dimmer and dimmer, the Charlatans spent a lot of their time performing live at the Fillmore Auditorium and Winterland, which were run by Bill Graham, and the Avalon Ballroom, which was run by Chet Helms and the Family Dog. The Charlatans played all three venues regularly, but the Avalon always felt like home. San Francisco’s main music impresarios: At left, Chet Helms of the Family Dog. At right, Bill Graham. Both photos are circa 1966 and by Herb Greene. The Charlatans were supposed to open this 1967 benefit at Winterland, but when Mike Ferguson failed to arrive at the gig on time, Bill Graham kicked the band off the stage. Via ClassicPosters.com. 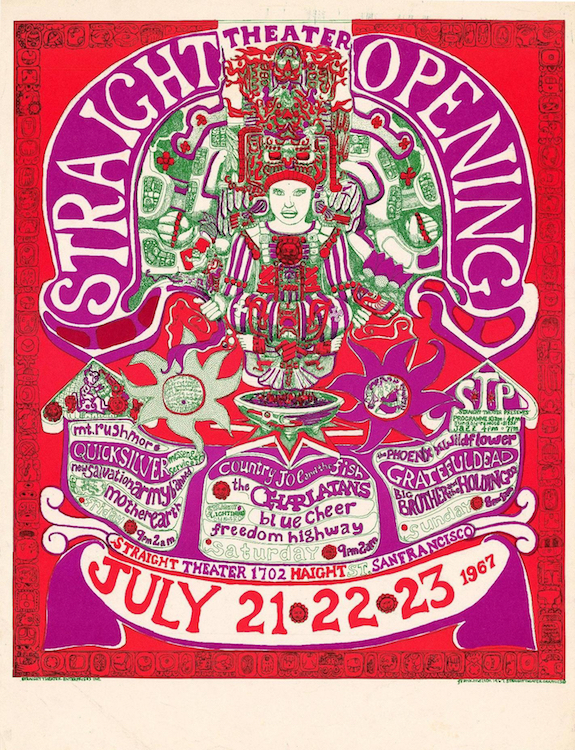 Along with the Grateful Dead, Country Joe & the Fish, Quicksilver Messenger Service, and Big Brother and the Holding Company, the Charlatans played the opening of the Straight Theater on Haight Street during the Summer of Love. Poster by Frank Melton via ClassicPosters.com. In addition to playing the Fillmore and Avalon, the Charlatans were booked at the Matrix, Western Front, the Straight Theater, the Firehouse, Sokol Hall, the Ark in Sausalito, Harmon Gym over in Berkeley, and a tavern out at Muir Beach. Lots of other bands on the psychedelic music scene in the first half of 1967 played those places too, but only the Charlatans decided to also spend six weeks performing at a strip joint on Montgomery Street. Richard Olsen had finally made it to North Beach, although probably not in the way he would have thought when he and his clarinet arrived at San Francisco State. In hindsight, the band’s run in March and April of 1967 at Varni’s Roaring Twenties was a bookend to its residency at the Red Dog. Both periods were soaked in drugs—a psychedelic substance called DMT was the stimulant of choice at Varni’s—both lasted about six weeks, and both included four or five shows a night, five or six nights a week. 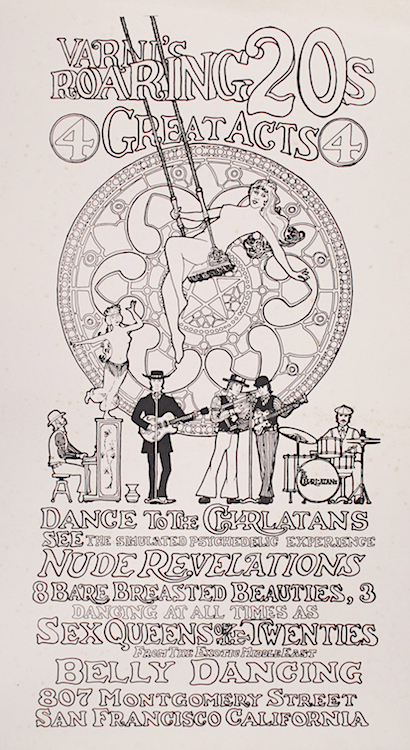 This poster by George Hunter and Nathan Terre, who was the Charlatans’ manager for a short period of time, was created toward the end of the band’s spring 1967 residency at Varni’s Roaring Twenties, an upscale strip joint in North Beach, but it was never used because the band was either fired for not playing a cover of “Winchester Cathedral” or quit when the club owner refused to pay them a union rate—or both. 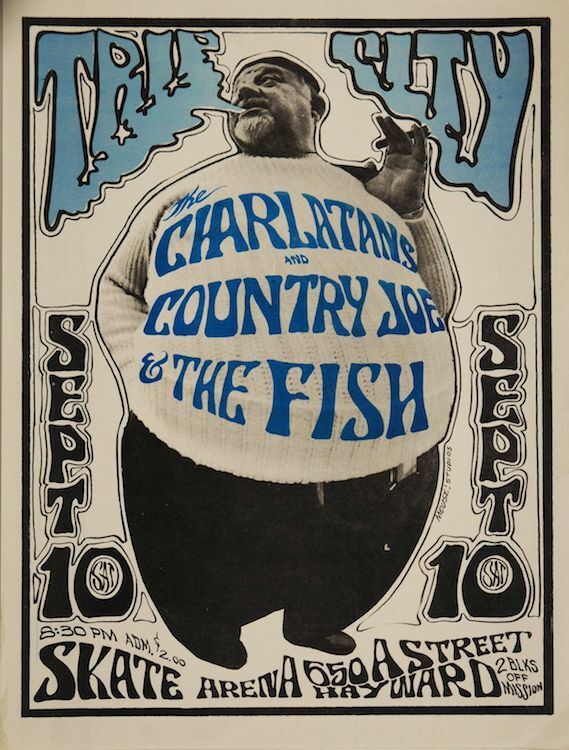 A rare East Bay gig for the Charlatans, with Country Joe & the Fish, in 1966. Poster by Stanley Mouse and Alton Kelley, via Psychedelic Art Exchange. This Family Dog poster from 1967 was a collaboration between George Hunter and poster artist Rick Griffin, with a Herb Greene photograph as the main image. Via ClassicPosters.com. Two reasons are given for why the Charlatans’ run at Varni’s ended. “Bill Varni wanted us to play a cover of ‘Winchester Cathedral’ during our act.” At the time, the ’20s-sounding song by The New Vaudeville Band was an enormous hit. 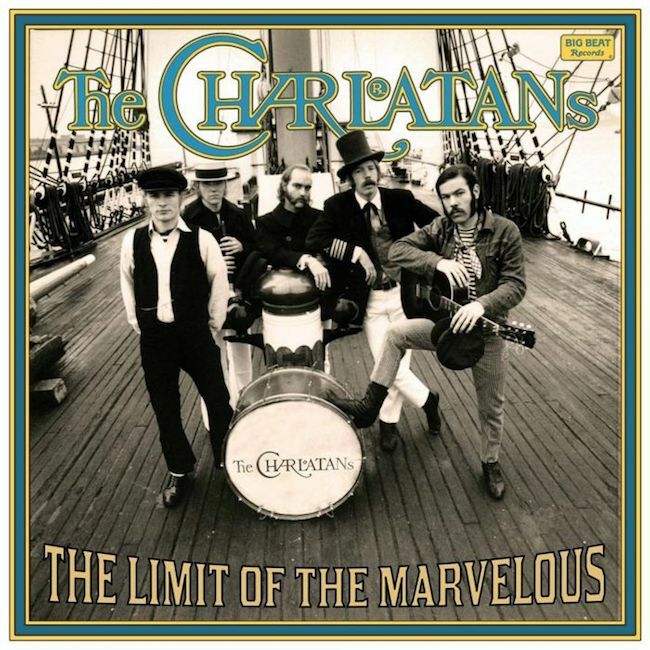 With their straw-hat skimmers and Edwardian threads, the Charlatans looked the part, and the song would have been perfect for a place called Roaring Twenties. “Yeah,” Hunter agrees, “it would’ve been perfect, but I said, ‘No, we don’t do covers.’” Which, of course, was not totally true since the band’s first single was a cover, but it seems to have been a point of principle for Hunter, if not something he communicated to the rest of the band. 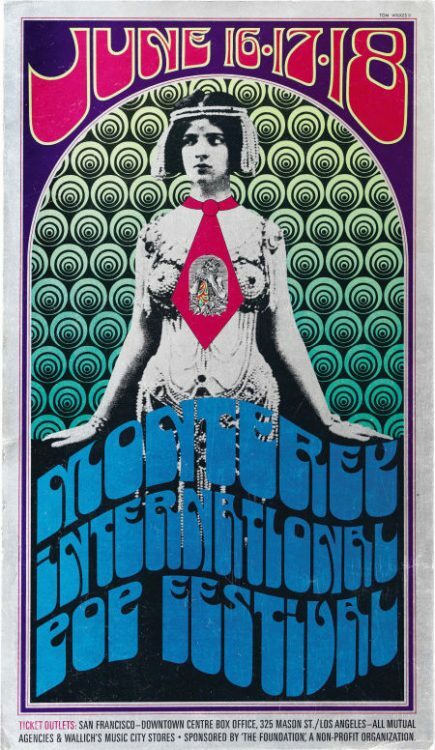 The weekend of the Monterey International Pop Festival, which kicked off the Summer of Love in 1967, the Charlatans were playing in a bowling alley for a high-school dance, and got arrested for possession of marijuana. That said, psychedelic rock music was the soundtrack for the Summer of Love, whose blockbuster—to continue the clichéd movie-biz analogy—was Monterey Pop, which ran from June 16 to 18 at a fairground a few hours south of San Francisco. Naturally, the San Francisco Bay Area was well represented. Big Brother and the Holding Company was there (the band actually played two sets because Janis Joplin was pissed off that their first set had not been filmed), as was Quicksilver Messenger Service, Country Joe and the Fish, Moby Grape, the Electric Flag, Steve Miller Band, Jefferson Airplane, and the Grateful Dead, whose set was sandwiched between performances by the Who and Jimi Hendrix. Of the San Francisco groups not invited to Monterey Pop, the Charlatans were the most glaring omission. They could have attended anyway, probably getting back stage to rub elbows with Ravi Shankar, Brian Jones of the Rolling Stones, and Otis Redding. Instead, the band found itself playing yet another crappy gig—and getting arrested for its trouble. Alton Kelley designed this poster for a 1966 show using William Westwick’s photo taken at the Red Dog in 1965. Via ClassicPosters.com. “George had booked us to do a high school dance in San Jose,” Wilhelm says. “It was somewhere down the Peninsula at a bowling alley,” Olsen recalls. The gig was such a yawn that the band’s piano player, Mike Ferguson, decided he had better things to do. “Mike had a jacket that I decided to wear that night.” Olsen continues. “He always carried 10 or 12 joints in its outside breast pocket.” What could possibly go wrong? Upon being booked into a San Jose jail, the band members were forced to take off all their clothes, which the police vacuumed for evidence. Now, anyone who has rolled a joint knows that they are not exactly hermetically sealed containers, which means there was probably about a joint’s worth of marijuana wedged into the seams of Ferguson’s jacket. “They found enough pot in the breast pocket alone to charge us all with felonies,” Olsen says. Wilhelm remembers one line of their spirited, if futile, defense: “We’re all, ‘Hey, man, we buy our clothes in thrift stores. Who knows what’s in them?’” Needless to say, that argument did not fly. A year of court appearances in San Jose, with representation by noted rock attorney Michael Stepanian, came down to one question: Who was going to take the rap? “It was between George and Wilhelm and me,” Olsen says. “Somehow Dan had snuck out of the whole thing, while Mike already had a felony because of his arrest with Chandler Laughlin.” “The law for weed was the same as the law for heroin,” Wilhelm says. “A second conviction for me would have meant a mandatory two years in San Quentin.” Since Olsen had been wearing the jacket, and Hunter was apparently never an option, Olsen agreed to take the fall. It did not involve jail time, but expunging the felony from his record took years, as did paying off the legal bill. In March of 1967, the Charlatans shared a bill at the Avalon with Big Brother and the Holding Company and Blue Cheer. 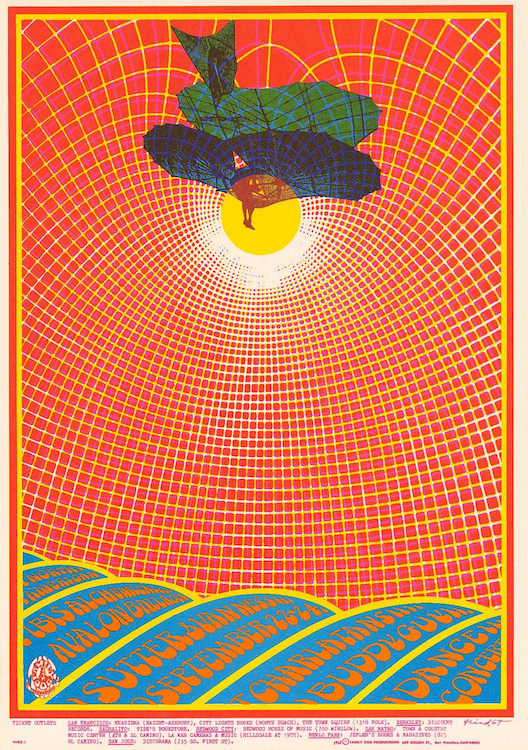 Poster by Victor Moscoso via ClassicPosters.com. 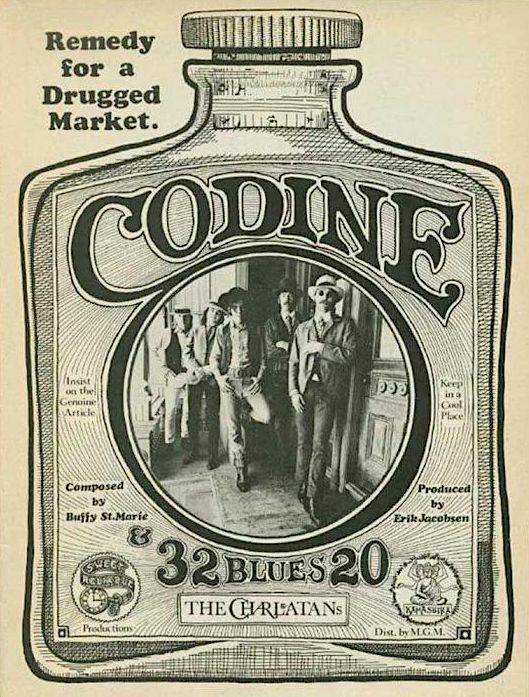 In hindsight, the ill-fated weekend of Monterey Pop, combined with the decision by Kama Sutra not to release “Cod’ine,” was the one-two punch that would eventually put the Charlatans on the canvas. Mike Ferguson was the first to go, playing his last show with the band on October 30, 1967, at the Matrix. “When you’re just going and going, and you’re not making any money, and you know that if something good like a record happened you’d be at another level, it’s frustrating,” Olsen says. For the Charlatans, economic and artistic frustration often expressed itself in fist fights, and not just off stage. “Yeah, there were a couple of good fights on stage,” Olsen says. “One time we were playing some college, and Dan just got up from behind the drums and started chasing George around the stage.” Another time, Hicks and Ferguson got in a fight on stage at the Avalon, and then there was the night when Ferguson just up and left the stage in the middle of a gig. “They didn’t get along and couldn’t resolve their conflicts, and that took a lot of the energy out of the music,” Lucy Lewis says. 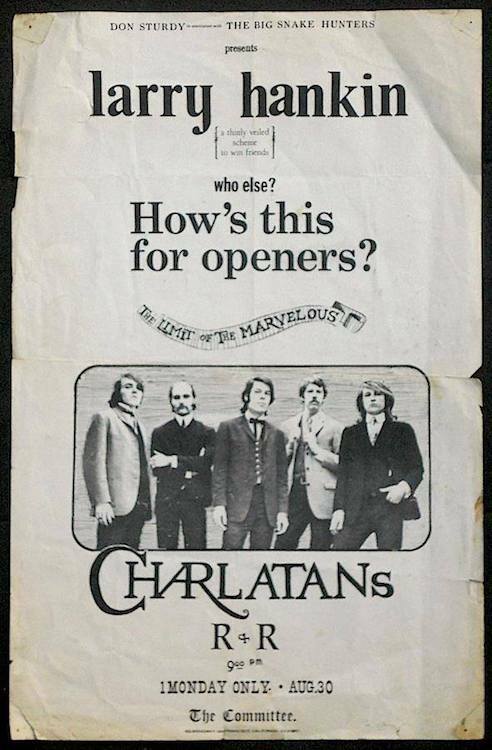 By the time of this June 1968 show at the Straight Theatre, Richard Olsen and Mike Wilhelm were the only two original members of the Charlatans in the band. Poster by Nathan Terre. This second incarnation of the Charlatans lasted barely six months, coming to an end on April 14, 1968, in Vancouver, B.C. There, Hicks and Gogerty played their last gigs, as did Hunter, whose leadership, or lack thereof, had finally become too much for Olsen and Wilhelm. 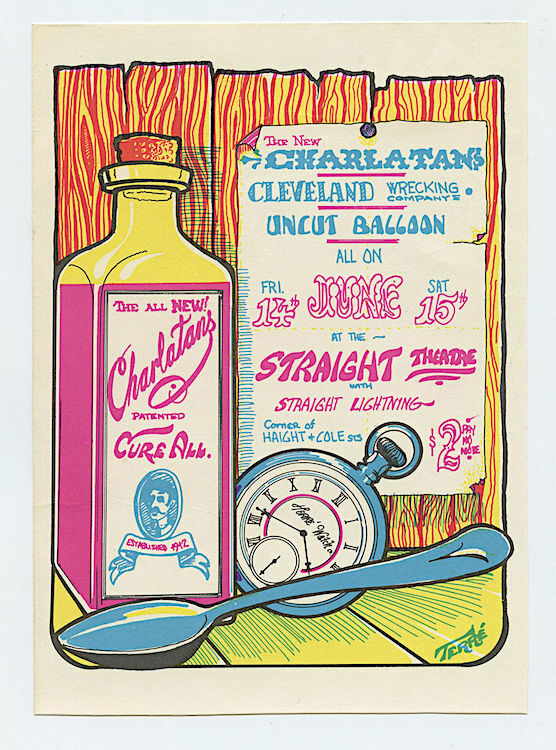 One of the Charlatans’ last performances was at the Fillmore West in 1969. Poster by Randy Tuten via ClassicPosters.com. On the other hand, the Charlatans may have been too tough a nut for any manager, even a pro like Cavallo, to crack. “They were unmanageable,” Lucy Lewis says, a sentiment echoed almost word for word by Wilhelm. “We were pretty unmanageable,” he agrees. 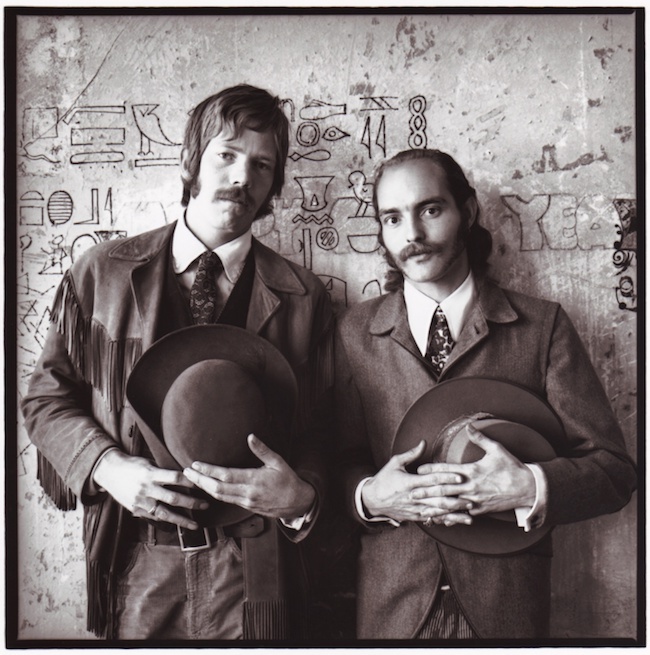 Be that as it may, if the problem with George Hunter was that he wouldn’t—or couldn’t—cede control of the band’s decision-making, the problem with Dan Hicks was that in some respects, he wanted to be the band’s George Hunter. “Dan wanted to be the frontman, all the time,” Olsen says. As it turned out, though, Hunter’s forced exit from the Charlatans coincided with Hicks’ decision to start a band of his own. 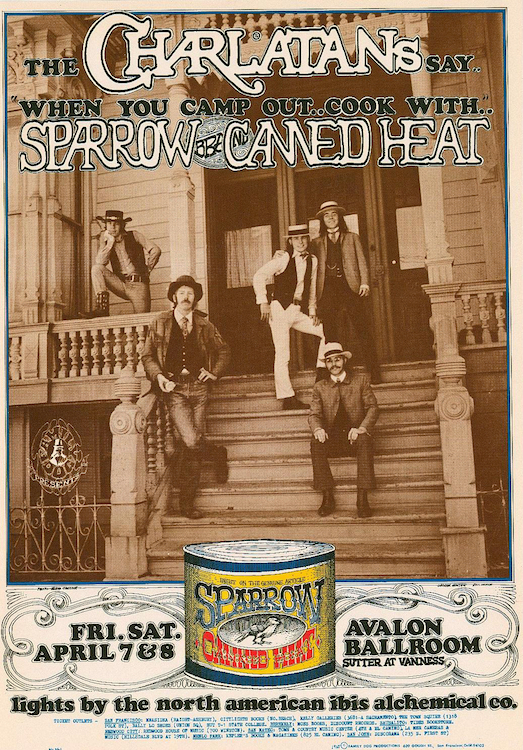 Awkwardly, a few months prior to their formal split in April 1968, the Charlatans found themselves on a bill one weekend at the Avalon, playing second bill to Country Joe and the Fish, with a new group called Dan Hicks and His Hot Licks as the opener. 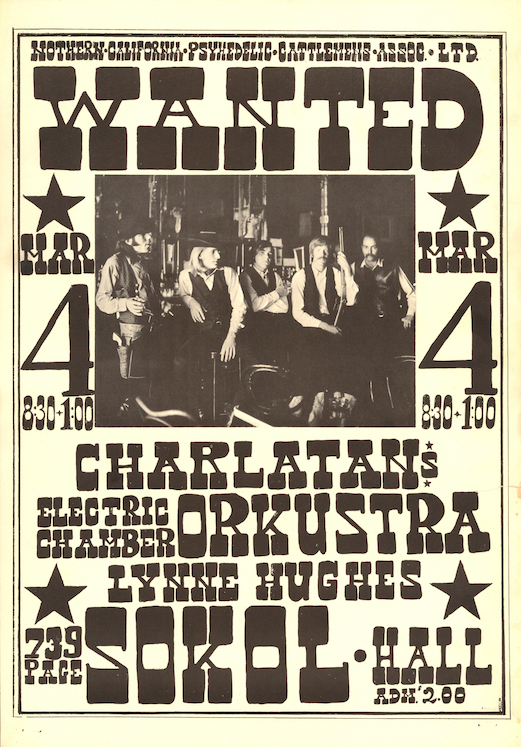 Richard Olsen of the Charlatans only learned that bandmate Dan Hicks had formed a band of his own when he saw this poster in January of 1968. That may be why Alton Kelley titled it “Heavy.” Within a few months, Hicks would leave the Charlatans for good. Via ClassicPosters.com. Still, the Charlatans were not quite done. In fact, one of Olsen’s favorite shows he ever played as a member of the Charlatans was in the band’s last incarnation, alongside Wilhelm on guitar, Wilson on drums, and a new keyboard player named Darrell DeVore. 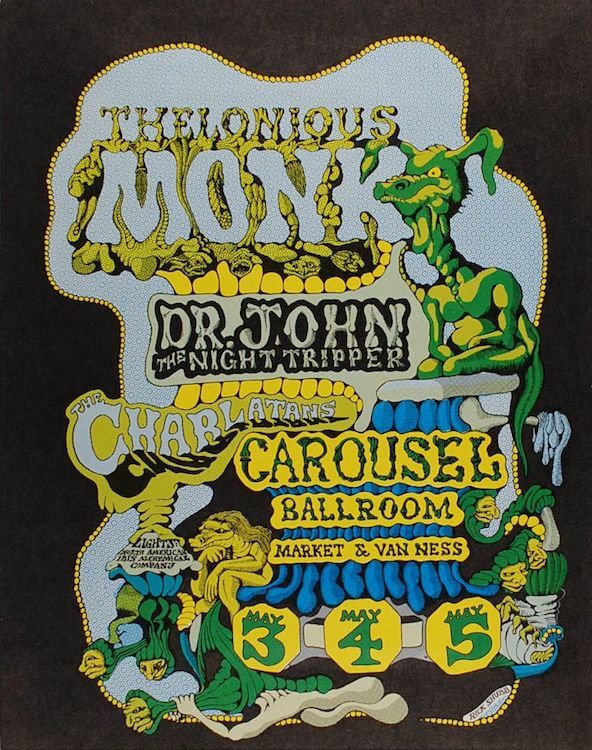 It occurred over the weekend of May 3, 4, and 5, 1968, when the Charlatans opened a concert at the Carousel Ballroom for psychedelic-zydeco sensation Dr. John the Night Tripper, whose highly influential “Gris-Gris” album had just come out. Jazz legend Thelonious Monk was the headliner. For the next few months, Olsen and his other bandmates played a few gigs here and there, occasionally billed as the “New Charlatans,” while simultaneously working to extricate themselves from their nightmare record deal with Kama Sutra. That milestone was eventually brokered by one of the attorneys who had represented Olsen and the Charlatans after their 1967 arrest for possession of marijuana. In part, it seems, the attorney got the band out of a bad contract and into a better one so they could pay his legal bill. One of Olsen’s favorite shows he ever played as a member of the Charlatans was in the band’s last incarnation. Within a few months, the Carousel Ballroom would become the Fillmore West. Poster by Rick Shubb, via Psychedelic Art Exchange. Unfortunately, a handsome album filled with some “pretty good tunes” was way too little, way too late, for the Charlatans. After a weekend at the Fillmore West in May of 1969, followed by a weekend at Family Dog on the Great Highway in June, the Charlatans were no more. “When you’re not invited to Monterey Pop and Woodstock, you have to know it’s over,” Olsen says. Which didn’t mean it was necessarily over for the band’s members. Wilhelm stayed particularly busy, founding a band called Loose Gravel, which performed for seven years, before joining the Flamin’ Groovies and then going on to make a name for himself as a solo performer. Hunter would continue to do graphic design as Globe Propaganda, with side projects in furniture and cabinetry. Hicks, of course, had his Hot Licks (his posthumous memoir, “I Scare Myself,” was published earlier this year), while Olsen would go on to run Pacific High Recording in San Francisco before starting his own big-band orchestra. Years later, in 1996, a compilation CD of material recorded between 1965 and 1968 would be released by Big Beat Records as “The Amazing Charlatans.” In 2016, selections from that album would be pressed onto burgundy vinyl, again by Big Beat. The packaging, designed by Hunter, features a Herb Greene photo of the band in its prime, shot aboard the Balclutha. But the album’s title, “The Limit of the Marvelous,” the phrase taken from that 1914 “Kar-Mi” poster, was not of Hunter’s choosing. “I don’t know where they got off naming our album,” Hunter says. “It should have been called ‘Shipping Out’ because it was the last gasp of the group. It was made just before Dan died. But I couldn’t get any traction with anybody to call it that.” All these decades later, it’s still tough for Hunter to let go. For his part, Wilhelm is less conflicted. “Buy two copies and play one,” he suggests.